Ryans win Lido 14 Class Championships! 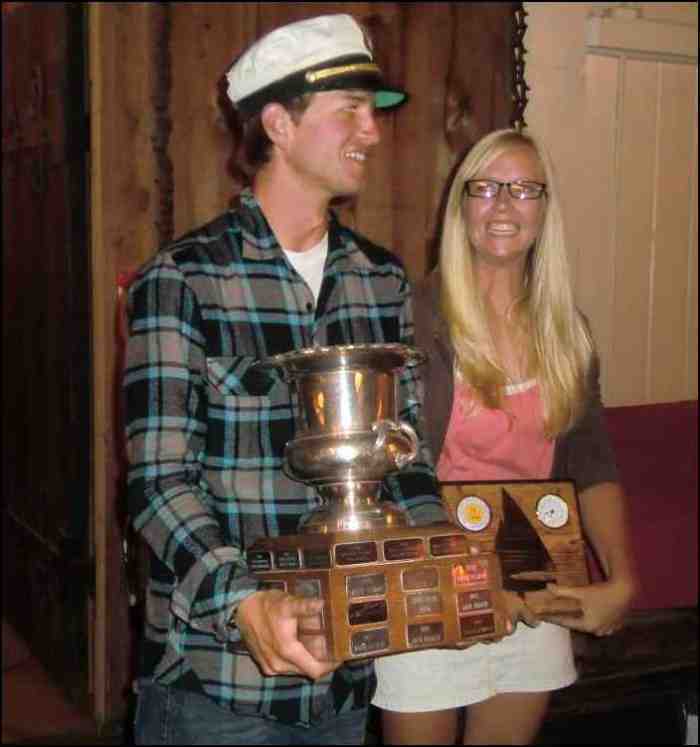 Brother and sister Lido 14 sailors Mark and Sarah Ryan (Long Beach, CA) bested defending and six-time champion Stuart Robertson at the Lido 14 Class Championships held on Huntington Lake in California on July 13-15. Forty-two boats competed in the event. It took an OCS by Robertson and his team mate Mike Anctil in the first race – with no throw outs provided in the five race series – for the Ryans to prevail over Robertson, who was first to finish in every race except the first. Also OCS in the first race was Lido 14 newcomer Steve Klotz, a two-time Flying Junior World Champion. Klotz and his teammate Hiroko Sakimoto were a potential top three finisher but for his premature start in the first race. Rounding out the top five teams were Kurt Wiese and John Papadopoulos, Stuart Robertson and Mike Anctil, Kent Foster and Pam Fairley, Kelly Cantley and Kevin Thomas. Huntington Lake, located in the Sierra Nevada mountains above Fresno, California, a popular choice for the Lido 14 Class Championships, provided near ideal sailing conditions for the event. The Lido 14 is a family oriented 14 foot sloop that has been in production since 1958 by W.D. Schock Corportion in Covina, California. The above photos are provided courtesy of Jane Schock and Riley Schupak. The first 3 of 5 championships series races were sailed on Wednesday. The lake was fully powered up with winds probably in the mid teens. The races for the Gold Fleet were approximately windward/leeward in configuration (boats had to round the very wide start line). The races for the Silver Fleet were a combination of windward/leeward and windward/leeward with an out and back reaching leg in the middle. Provisional scores are shown below. The items in red are unofficial corrections from the posted scores. With no throw outs provided, the contest appears to between the Ryans, Eric Heim, and Kurt Wiese. See scores above. The first stage of the Championships is a qualifying series of races to assign the 42 teams into two fleets: Gold and Silver. Three races were held Tuesday and the scores of those races are listed below. Note that the current Class Champion (Stu Robertson) is given the choice to sit out this series and be automatically assigned into the Gold Flight. The first 21 teams and Stu Robertson will sail in the Gold Flight, the remaining will sail in the Silver. Except under very special conditions (not enough wind later on), these race scores will not be carried forward into the Championships. The winds were moderate with occasional puffs requiring full hiking and showed little of the irregularities reported for the High Sierra Regatta that preceded this event. The 2010 Class Championship Regatta (CCR) is being held on Huntington Lake following the first weekend of the High Sierra Regatta, a very popular one design regatta organized by Fresno Yacht Club. Racing for the Championships will commence on Tuesday July 13. Please read the Notice of Race, Entry Form, and Measurement Checklist documents available via the links below. On 6/4/2010 a revised NOR (v3e) and Entry Form were emailed by Association Secretary Dave Carroll. They are now available here too.